When DTCM South Africa asked me what I would like to do while in Dubai, one of the things at the top of my list was going on a Desert Safari. Carrie Bradshaw made it look so glam and I had this image in my mind of me riding a camel in a long dress along the desert. What I got was a completely different experience but it was so much more awesome! The Dessert Safari is all about riding those dunes in a massive Land Cruiser, dinning in an Arabian style-tent and experiencing the Middle East the way it was meant to be experienced. After first arriving in the desert and deflating our tyres we got to see a falcon show, presented by none other than a home-grown South African and his little falcon, Bomer. She might look cute but don’t underestimate her! Once we were done with the dune riding, we stopped in the middle of the desert to watch the sunset, which left me speechless. The beauty of this country amazed me, and I was so busy looking at the sunset that I didn’t even get any pictures with it. At first I wanted to wear a long gown for this trip, but I was quickly told that sand is in fact not as glamorous as Carrie Bradshaw made it out to be, and that I need to make myself comfortable. I put on this gorgeous jumpsuit from my friend Georgia who designs her own line of clothing called Fortune on Spree, and accessorized it with a turban to which I added a peacock feather. Gladiator sandals, new Prada sunnies and a red lip finished off my Desert Queen look. PS The sand got into my shoes like maaaaaad. As we were bouncing around the sand which was super soft, DTCM South Africa had another treat in store for us- we were gifted traditional Abayas to wear on the trip! I loved embracing the culture of the UAE by donning this traditional dress and our amazing car driver Bukhari also turned out to be an amazing photographer. He took shots of me all over, and I am so glad to have these amazing pictures and memories from the Desert Safari. Once the sun sets, its back to the Land Crusier(no more wild driving though) and of to the camp where rows of tables and pillows are set up for you to come and sit right down and enjoy a traditional Arabic meal. We were so busy talking and eating that I didn’t even get a chance to capture the food, but it was pure Middle Eastern delight. 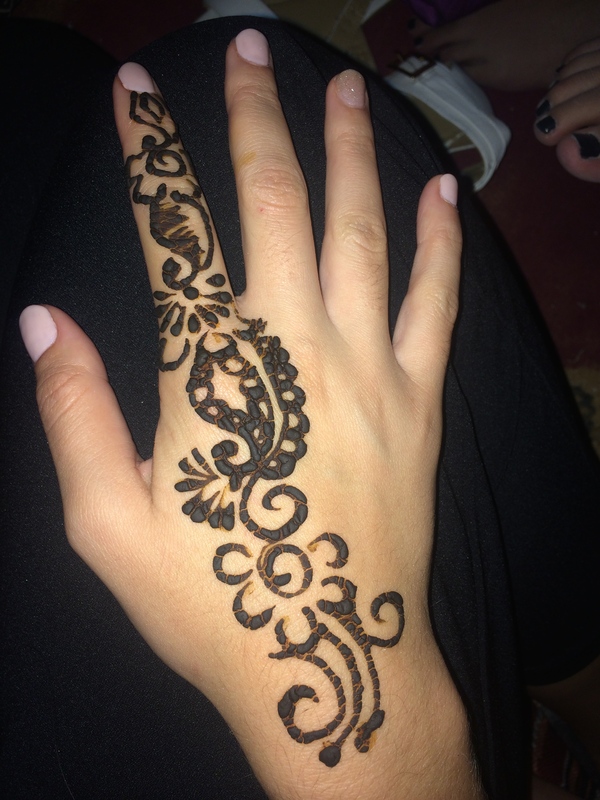 During dinner you can also get some Henna designs on your hands, watch a belly dancing show and smoke some shisa(hubby bubbly). You can also do a little camel ride, but we missed that because we were too busy yakking away. The night ends just after 9 pm after which you get transferred back to your hotel. Once again our driver made the trip even more fun by little us plug in our phones into the car and listen to our own music.Driving around the desert, jamming to “Turn Down For What” with my friends was the ultimate highlight of the night! A Dessert Safari is a must-do while you are in Dubai, and you can contact Arabian Adventures to find out all the details for it. Make These Cute Melting Snowmen Cookies With Me(Step By Step)! I like the black jumpsuit it’s gorgeous. That drive back to the hotel was epic! Acting like crazy kids in a crazier city that never seems to sleep. Glad you had this wonderful opportunity 🙂 This trip looked like it was AMAZING! 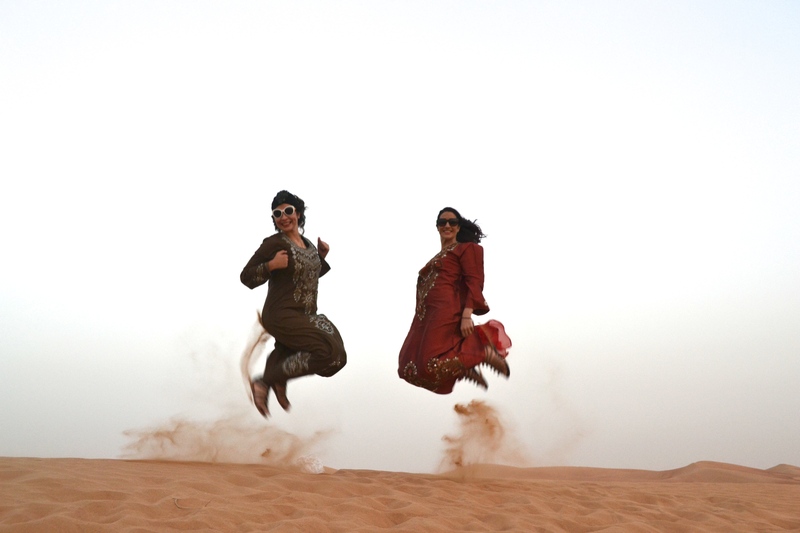 The desert safari was one of my best highlights when I visited Dubai! I had the same horrible (nauseating) experience on the ride across the dunes but once I got out and saw the beauty all around, it was quickly forgotten! Everything else makes up for that bumpy ride so it defs cant be missed!